Physicists have done something in California that could someday solve all the energy problems of the world — they've created nuclear fusion using laser beams. Theirs was a small step. The energy released by the hydrogen fuel source immediately fizzled and ultimately spit out enough energy to power a light bulb for as long as it takes to brush your teeth, according to a report Los Angeles Times. But here's the mind-blowing part: The energy they created was greater than the energy of the fuel they began with. "This has never been done before in laboratory fusion research, " says Mark Herrmann, a Sandia National Laboratory scientist not involved with the research. He spoke with the news blog of Nature, the journal that the "fuel gain" (that's what net energy is called) laser experiment on Wednesday. Taken up to scale, many people believe the result would be the most fuel-efficient energy source ever devised. Nuclear fusion is the process by which the nucleus of atoms collide and combine to convert light elements, like hydrogen or helium, into heavier ones, including carbon or oxygen. It takes an incredible amount of energy to do this — for example, nuclear fusion is the main job of the sun. When it happens, heat and photons (that's light particles) are released. The opposite reaction, by the way, is called fission, in which the nucleus is split. The two bombs dropped in Japan were fission bombs, and most of the world's nuclear power plants rely on fission reactions. Scientists have been trying for a long time to create a new, more efficient form of energy production by tipping off fusion reactions that turn hydrogen into helium. At the Lawrence Livermore National Laboratory in California (under the Department of Energy) scientists had installed $3 billion worth of laser beams dubbed the National Ignition Facility. It comprises 192 lasers, which the researchers recently pointed at a small capsule full of hydrogen atoms. Then they fired the lasers with the force of 500 trillion watts for one-millionth of a second, "about 10 trillion times the entire electrical output of America" over the same time period, reports James Conca in Forbes. 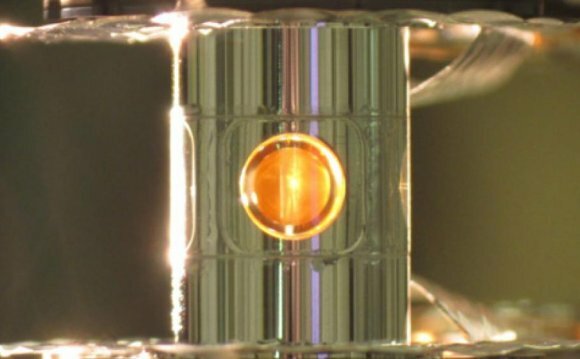 Their hope was that the laser energy would cause enough fusion to take place that the same amount of energy would be produced — plus more. How is that possible? When the hydrogen atoms convert to helium atoms, the helium still has a lot of energy. That energy could simply escape. Or it could spread to another hydrogen atom and cause more fusion. It could reinvest. That's the "fuel gain." That's the "holy grail." In this case, the net gain was only 1 percent. Very much a baby step. "There is more work to do and physics problems that need to be addressed before we get to the end, " said the experiment's lead scientist, Omar Hurricane, in a statement. "But our team is working to address all the challenges, and that's what a scientific team thrives on."